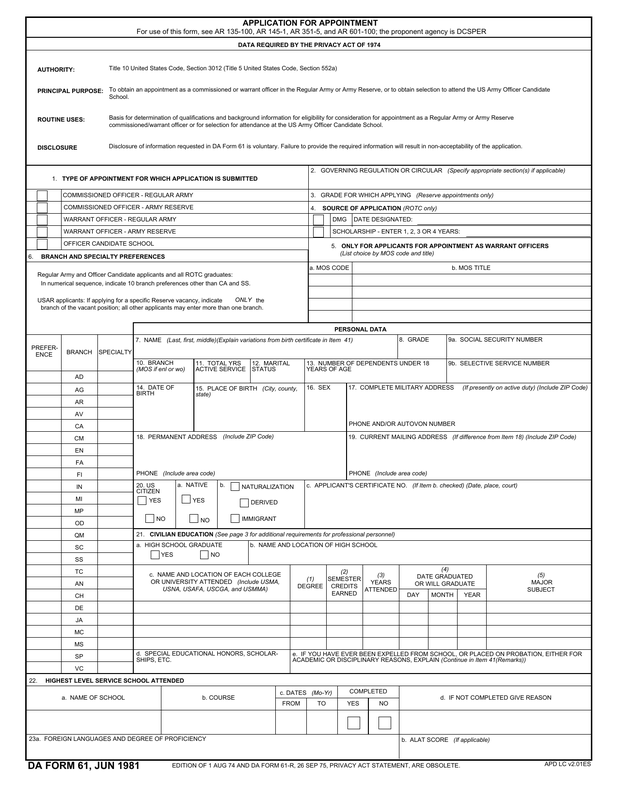 Download DA Form 61 also known as Application For Appointment. The purpose of this form is to obtain appointment in the position of warrant officer in the Army Reserve or the Army. This form may also be used to possibly obtain a selection to attend the U.S Army Officer Candidate School. All of the information on this form is voluntary, however, the form will not be accepted if there is failure to disclose all information that is required. If you are properly qualified, you may enter up to 3 MOS codes and titles. List MOS selections in order of preference. Listing more than one may require additional processing time. For all USAR applicants, should you apply for specific reserve vacancies you need to only indicate the branch of the position in which there is a vacancy. Special Education Honors, Scholarships, Etc. Read block 25 carefully and place an X for both boxes of both paragraphs, if you agree.